Since 1999 the mission of the CGEC has been to improve the health of North Carolina’s older adults by providing evidence-based and culturally competent geriatrics education and training, and enable health professionals to better serve the state’s increasingly diverse older adult populations. Our goals under the newly formed Geriatric Workforce Enhancement Program (2015 – 2018) include integrating geriatrics into primary care, promoting interprofessional education and bringing continuing education to communities across North Carolina. Geriatric training is more and more important as the population ages. The CGEC will…. The Carolina Geriatrics Workforce Enhancement Program aims to address the medical needs of North Carolina’s elders, families and caregivers by changing the structure of standard primary care systems. The CGWEP plans to educate and train caregivers and medical professionals in the field of Geriatrics so that more rural, underserved, and diversely populated areas in North Carolina are better prepared to treat their elderly patients. 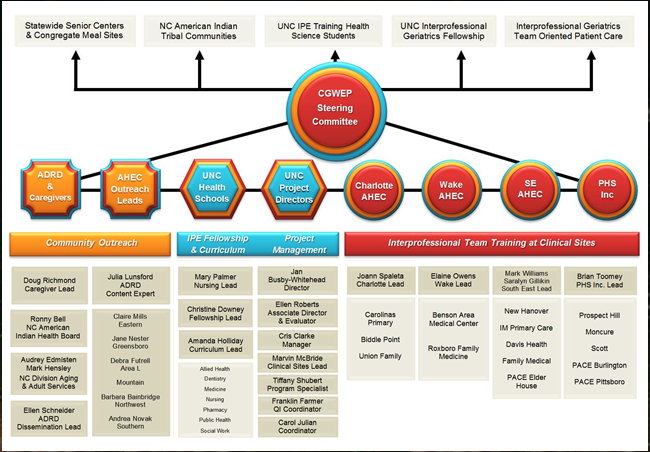 The UNC Chapel Hill health science schools (including dentistry, medicine, nursing, public health, pharmacy, social work, and allied health) will partner with four different Area Health Education Centers: Piedmont Health Services, Southeast AHEC, Charlotte AHEC, and Wake AHEC to implement these plans of transforming primary care through the integration of Geriatric education and training. 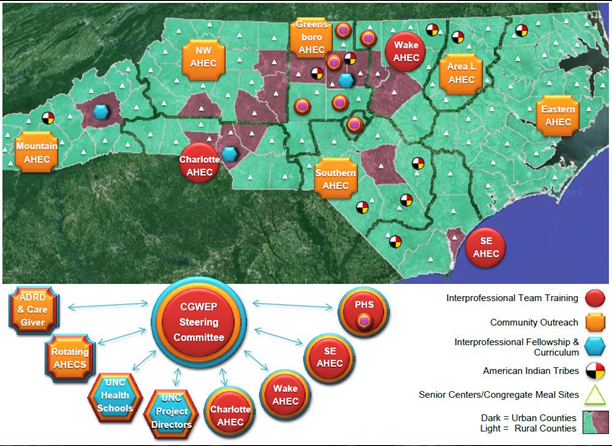 UNC Chapel Hill will also partner with: Mountain AHEC, Northwest AHEC, Greensboro AHEC, Area L AHEC, and Eastern AHEC. These AHEC community partners, along with the help of Alliant Quality, the NC American Indian Health Board, Alzheimer’s North Carolina Inc, and the Alzheimer’s Association will work together to develop and deliver continuing education resources in the field of Geriatrics. These resources and curricula will then be implemented into: the UNC Chapel Hill health science schools mentioned above, Piedmont Health Services, and the other AHEC primary care sites through a series of 2-year fellowship programs in nursing, geriatric medicine, and dentistry to reach students and develop a broader Geriatric workforce. As a final result, primary care providers will document when geriatric assessments and interventions are needed for each patient and the number of geriatric-based professional teams will be increased in primary practices. The CGWEP and its community partners will extend education and training on geriatric screening and syndromes, not only to direct care workers, but also to patients and families. With doing so, we hope that trainees will better be able to manage elders’ health conditions, and improve overall quality of life.